You are able to filter the items by their bound status, chosing it from the dropdown box at the Advanced Filters subfilter row. This is weird, here is the proof it shows for me (German text "Gebunden" = Bound). I'll compare the officaly relesaed version here with mine but they should be the same. If not I'll update it. Have checked the files and they are totally the same. So it should show up for you as well. If it does not show up simply disable ALL other addons except "AdvancedFilters BETA" and "AF filter plugin - Bound items". CHeck if it shows up then. If so, enable the other addons you are using again 1 after another and check which one breaks it then. Or is your AF dropdown box list too long, you got too many filter plugins enabled and the entries are just out of sight for you? Are you using this version of AdvancedFilters (AdvancedFilters beta)? Then download the filter plugin addon from the link I have provided and extract it into the AdOns directory. And now you should be able to use it at Jewelry Crafting stations as well. It works for me at least. - I then restarted minion to see if they are recognized (in the right folder etc...). They are recognized but BOTH want to be updated - I did not update them. I left them as is. 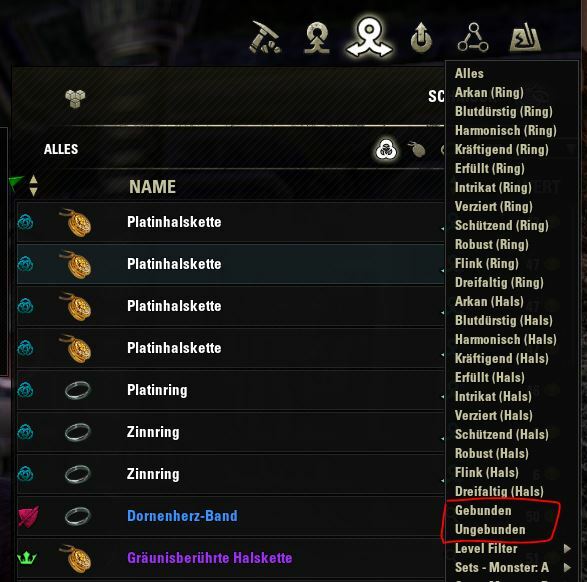 - I started ESO - ensured addons were check and out of date were allowed. - I shut down ESO, updated both AddOns via the minion update button. - Restarted ESO - still no bound filter at the JC table on deconstruction page/tab. Last edited by Baertram : 03/11/19 at 11:50 AM. Last edited by derat : 02/24/19 at 05:23 PM. Are you able to add Bound to the Jewelcrafting decon window as well? Try this version, does it work for you? This doesn't seem to work in crafting windows? ? ? Woot! TY, I actually saw it suddenly had the feature before I saw this comment and came to delete my post or say never mind, I'm on crazy pills - but Ya! not Crazy and Ya! Great addition! Last edited by Baertram : 10/21/18 at 07:53 AM.